While I’ve been gone, a whole bunch of stories broke about the sequel to Star Trek. And then those stories were refuted. And then new stories broke in their place. The internet moves pretty fast. If you don’t stop and look around once in a while, you could miss it. J.J. Abrams’ Star Trek sequel finally has a release date: May 17, 2013. That’s almost a full year after its original date (June of 2012), and now means there will have been four years between the first film and its follow up. Benicio Del Toro will not be in the sequel, as I originally wrote a few weeks ago. It seems that his contract negotiations fell apart last week. This means he won’t be playing Khan, the rumored villain in the film (as scooped by Latino Review). This doesn’t mean that Khan isn’t the villain. After Latino Review broke the story, Drew McWeeny of Hitfix followed up with Abrams and got a response of “Not true.” But that was in connection to Del Toro playing Khan; now that we know Del Toro is out, Abrams dismissal leaves the possibility open that Khan is still the villain — just that he’ll be played by a different actor. Alice Eve (pictured above, rather shamelessly) and Peter Weller have both joined the cast, though no one knows in what capacity. A few people have speculated that Eve will play Yeoman Janice Rand, I guess because she’s blonde, but I don’t see that happening. 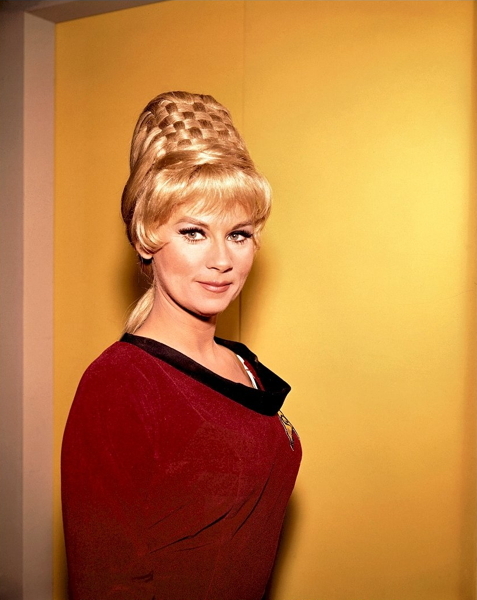 Besides, if anyone’s going to play Janice Rand it should be Mary Lynn Rajskub. UPDATE: Some hints at Weller’s role have slipped out in the last few days: he’s going to be playing some sort of CEO. So we know there are corporations in the future. I guess it’s no utopia after all. Zing! Take that, Jay Leno. UPDATE 2: Apparently, Carlos star Édgar Ramírez is now the front runner for the as-yet-unnamed villain. The fact that they are only considering Latino actors once again lends credence to the “Khan” theory, which is disappointing. I’ve already written about how small-minded it seems to go back to Khan, but I also shouldn’t be one of the hundreds of internet fanboys just adding to the speculation pile. Even if they’re going with Khan, I (along with EVERYONE ELSE) should wait to see the movie before making up my mind as to whether or not that’s a mistake.